Cut each chicken wing at joints to make 3 pieces; discard tip. Cut off excess skin; discard. In resealable heavy-duty food-storage plastic bag or large glass bowl, mix remaining ingredients. Reserve 1/4 cup of marinade to a small bowl and set aside; add chicken to marinade in bag; turn to coat. Seal bag or covered dish; refrigerate, turning once, at least 1 hour. Heat gas or charcoal grill. Remove chicken from marinade; discard marinade in bag. Place chicken on grill over medium heat. Cover grill; cook 45 to 60 minutes, brushing frequently with 1/4 cup reserved marinade turning once, until juice of chicken is clear when thickest part is cut to bone (180°F). Discard any remaining marinade. If you don't have oyster sauce, you can use 2 tablespoons of soy sauce instead. Purchase chicken drummettes (you'll need about 40) instead of chicken wings. Drummettes are cut up and ready for marinating. 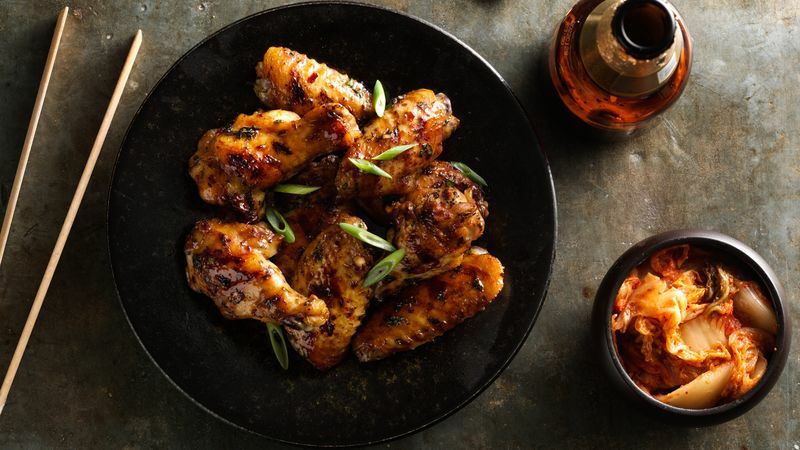 You can prepare and grill these zesty wings up to 24 hours ahead. Place in a rectangular pan, cover with foil and refrigerate. To reheat, place the covered pan in the oven at 350°F for 20 to 25 minutes or until heated.